← Pancreatic Cancer UK ‏@PancreaticCanUK Tomorrow is the big #DaveDay! The Council’s resistance to our Neighbourhood planning initiative has entered another desperate phase. In August they finally recognised that avoidance and delay was becoming unsustainable and designated a neighbourhood area (‘NA’) that does not correspond with our application area – or with anyone else’s. A challenge to that decision by way of a ‘call-in’ by the (very) minority Lib-Dems then triggered a referral to the so-called Oversight and Scrutiny Committee, occasioning a further convenient two months of delay. The OSC is a kangaroo court whipped by the majority Labour Party members into an obedient ratification of Council decisions and its members dutifully did what they were told on 20 October. In response we called a joint meeting of the BVAG-coordinated St Thomas St Plan and the phantom rival applicant ‘group’ that the Council has sought to promote: ‘Bermondsey Neighbourhood Forum’ (‘BNF’). In reality BNF had stopped holding meetings well over a year ago and its membership had all but evaporated. The few remaining members who turned up duly resolved to formally wind up what was by now nothing more than a straw man for the Council to use as a pretext for refusing to process the only valid application for Neighbourhood Forum Status, namely ours. 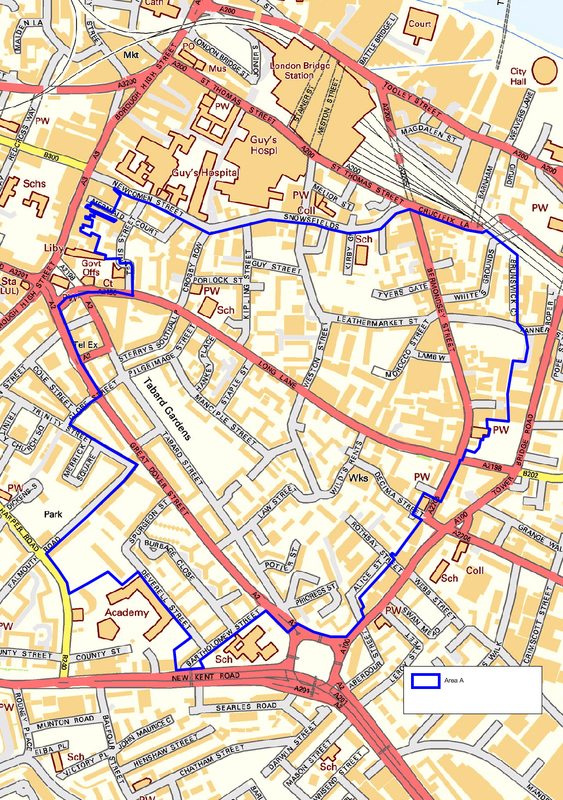 In order to remove any further opportunity for delay by the Council the meeting also, with reservations over its size and suitability reluctantly agreed to amend the STP to adopt the Council’s own designated area (‘Area A’, see below). The amended plan was given the working title of STP(D) and the Council was invited to finally approve our application. Given that they themselves had designated the NA selected and they had only one application from what in their own August report was acknowledged to be a qualifying group they were running out of wriggle-room. Without any plausible excuses remaining to them they have resorted to exactly what we anticipated at the meeting – further delay and a few half-hearted implausible excuses (See correspondence here). At the November meeting we had anticipated exactly what we got and we had also resolved to instruct lawyers to prepare for a Judicial Review of the Council’s refusal to process our application. Consequently leading Counsel’s advice was obtained in December. Together with his Junior, the barristers are now preparing the protocol letter before action required to commence a JR claim.